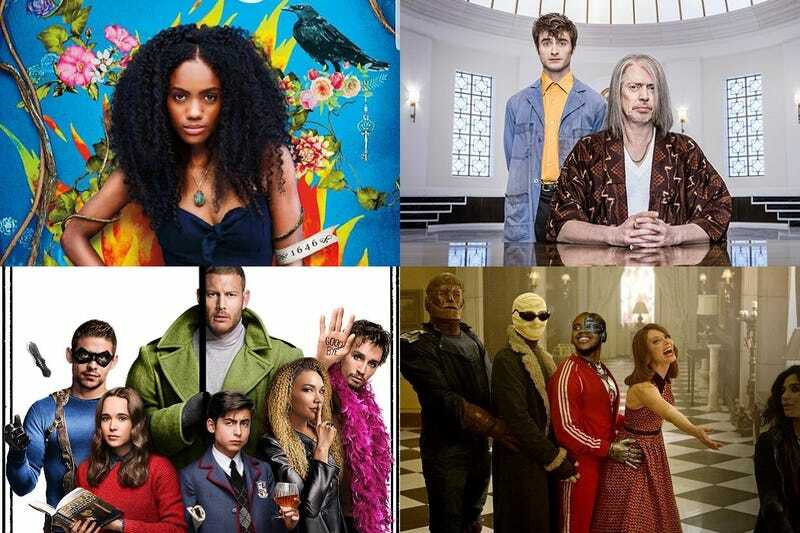 Clockwise from top left: Siempre Bruja: Always A Witch, Miracle Workers, Doom Patrol & The Umbrella Academy. We are entering a sweeps month, meaning we should be getting lots of new episodes for the currently airing shows. However, that doesn’t mean there are no premieres. Netflix starts off with a Colombian series featuring a 17th century time traveling witch and a comedy with a woman repeatedly dying at her 36th birthday party. There are also more superheroes coming to our screens as the Hargreeves attempt to stop an apocalypse and Dr. Caulder’s misfits are called to action by Cyborg. Youtube continues their foray into tv with a comedic sci-fi anthology and TBS launches their own anthology series with angels trying to save the Earth. The end of the month also sees the start of the final run of Shadowhunters episodes. Continue reading to see what’s coming to your screens this month and in the future. Carmen is a slave and a witch. She is 19 years old and is about to be burned at the stake for having committed a crime that cannot be forgiven: falling for a white man. But an old wizard offers her salvation—the ability to jump in time to a place where no one believes in witches. She will be able to travel if she agrees to use none of the powers. She agrees and finds herself in nowadays Colombia, starting a new life, meeting friends and even going to college. But once a witch, always a witch. About a woman caught in a Groundhog Day-type loop, repeatedly attending the same party, dying, and waking up the next day unharmed. A live-action movie based on the animated series about an average high-school cheerleader, who saves the world from supervillains in her spare time. Follows Ulysses, who is struggling to figure out his life in the surreal and bewildering city of Los Angeles. Between sexual and romantic dating-app adventures, Ulysses grows increasingly troubled as foreboding, premonitory dreams make him wonder if some kind of dark and monstrous conspiracy is going on — or if he is just smoking too much weed. It’s 2018, the Apocalypse is near and Final Judgment is set to descend upon humanity. The armies of Good and Evil are amassing, Atlantis is rising, and tempers are flaring. Everything appears to be going according to Divine Plan. Except a somewhat fussy angel and a fast-living demon are not actually looking forward to the coming war, and someone seems to have misplaced the Antichrist. Based on the Terry Pratchett and Neil Gaiman novel. A supernatural adventure comedy that follows two half-brothers spending a summer with their grandma in the small, mysterious town of Monte Macabre where Latin American myths and legends come to life.